All copies will be signed by me!! The regular price of this book is $14.00 plus shipping. The Sale Price of $12.00 includes shipping to all continental US States. If you are local and don't need it shipped the price is $10.00. "The Candle" is a story about life, loss and moving on, a story of Hope. 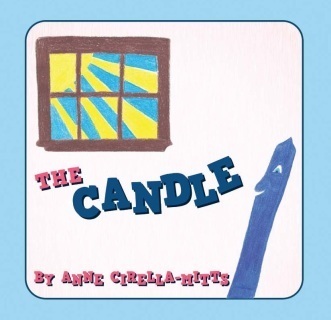 Little Blue, is a candle who has a simple life but also has a dream. He learns a very valuable lesson in this story. Even when things look grim and you think nothing will get better, miracles happen. Endings can be new beginnings. My hope is that this book will help children in more than one way. I feel this is a very appropriate book for children suffering a loss. The loss of a friendship, a dream, a home, a parent through divorce, or any loss. Processing these losses is hard enough for adults. It is almost impossible for children to understand. Reading about Little Blue's transformation may bring peace to children who have lost someone or something. I have donated this book to most of the local schools in my area and I sent copies to Sandy Hook after the tragic shooting there. The purpose of this book is to help children understand and heal. We all have dreams and sometimes our dreams don't turn out the way we expect them to. Children need to know that this is not the end of it. We can go on and have a new dream. There are other lessons to learn from this story and I won't give them all away. Read it for yourself. You won't be disappointed. This book is a must have for any child who has suffered a loss or disappointment. The story of Little Blue has resonated with children ages kindergarten through middle school and with adults. It is a story from the heart. To order a signed copy please email me at amc75_2000@msn.com.